MY JOURNEY WITH YARN AND BEYOND: Kick-Off Event - The Lands' End "Warm Up America Project"
Kick-Off Event - The Lands' End "Warm Up America Project"
Well I am so on a high. 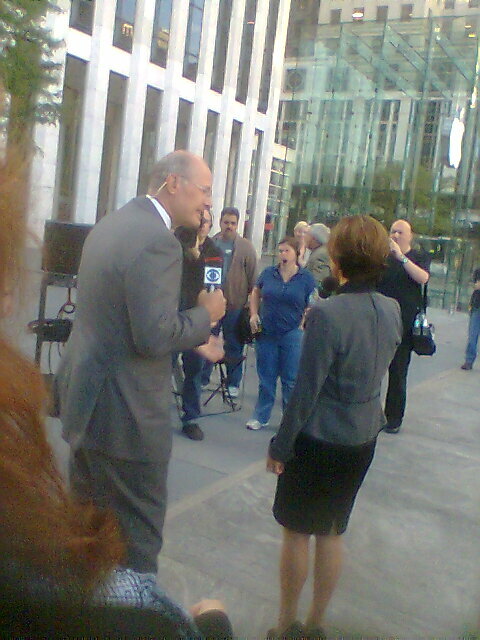 I went over to New York yesterday for an exciting event at the CBS Early Show taping. Lands' End has teamed up with knitting and crochet groups that include TKGA (The Knitting Guild Association) and Warm Up America. Brett Bara from the show Knit and Crochet Now is the spokesperson for the project. 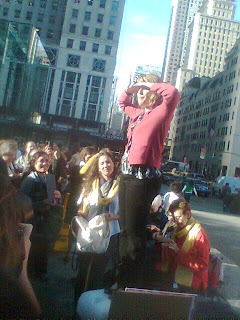 Lands' End "Warm Up America project" was sponsoring a group of knitters and crocheters to come to the CBS Early Show and support the kick-off for the following couple of months that this project will be running. While we were there we made squares using FeelGood Yarn for blankets that will be made for this project. To learn more about this project, click on this link Warm Up America. The whole day was great. I was not able to sleep so I got up at 2:00am. I was so excited for the day and a little uneasy leaving the house so early. I had to leave the house at 4:20am to make sure I got to the bus station for the 4:55am bus. I tell you that I didn't have to worry about being by myself because the bus was full. The bus came at 5:00am and I am not use to taking the bus that early. I was prepared with two projects (scarves), and reading to occupy my time. Well, I couldn't do my knitting or reading because the lights were out. People were sleeping including the man I was sitting next to and I didn't want to disturb him. Truthfully this didn't set well with me at first because I was all ready to do my knitting project. But I took the time to rest myself. Of course, I really couldn't rest too much because I was so excited. I really needed to knit to calm down. I got to New York and proceeded to the track for the 1, 2 or 3 train going uptown to 59th Street. The event was on the corner of 59th Street and 5th Avenue. So after leaving the train station I walked four long blocks to 5th Avenue. 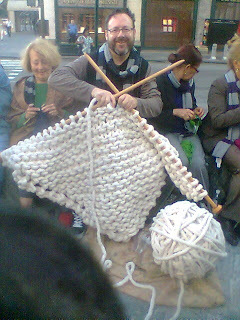 When I got there a hand full of knitters/crocheters where there and the crew for the event were setting up. 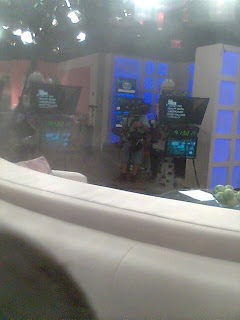 The crew from the Early Show was also setting up so it was exciting to see it all coming together. I was in the first number of 50 people to arrive so they were giving away a nice Lands' End scarf. Then the first 20 people that finish their square got a tote bag. I don't know why I chose to knit my square when I know that crochet is faster - unbelievable - LOL. But I have so many totes I really don't need one. Three times they drew names for prizes. No I didn't win. 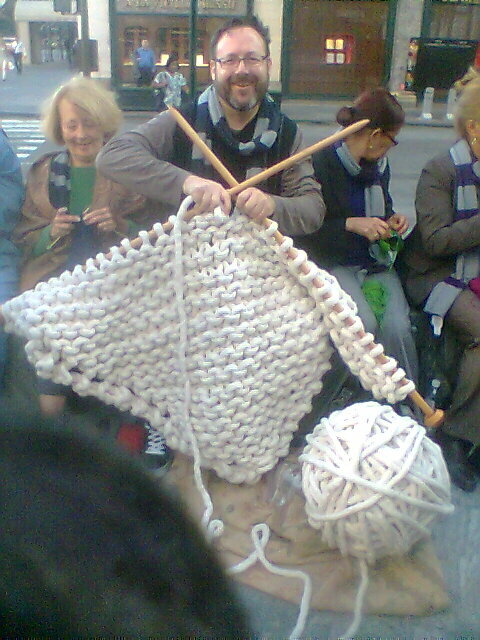 I got to see friends from the Harlem Crochet and Knit Out 2 and met new friends which is always nice. The show started and we continued to knit/crochet. You know when you see something on TV you wonder what really happens. Well, it was like that. Being there live was really exciting. But we couldn't hear the show and I thought that the audience did. So what we did was a lot of shouting and showed our excitement to be there every time the camera glided across the crowd. Then Harry Smith, Dave Price and Maggie Rodriguez of the Early Show came out to join us and talked with a few of the knitters/crocheters. The host of Knit and Crochet Now show Brett Bara was there and we got to talk with her. A few representatives from Vogue Knitting were there also. It was a successful event and I think it got the point across that knitting/crochet is not going anywhere and it is very alive and there is a lot of activity going on. When the taping of the show was finished the ones that could stay went on tour of the Early Show studio. It is taped in one room but understanding how they change things around and do the taping was really interesting. After, a group of us went for a late breakfast and I came home. An end to a lovely day and I am so energized and excited to do more. I wished I had a knitting group to go to last night. There is a lot going on in the needlearts world and there is a place for you somewhere in the mix if you are not already involved in the extras.